Today's IT environment is very complex, encompassing a myriad of technologies and middleware platforms. Many organizations have large and heterogeneous middleware platforms that power their enterprise applications and it is often a real challenge for administrators to meet agreed service levels and minimize downtime. Oracle Enterprise Manager allows administrators to manage the complete lifecycle of an entire application infrastructure for middleware and SOA applications. This book will help you kick-start the setup of Oracle Enterprise Manager Grid Control and master all aspects of middleware management supported by Oracle Enterprise Manager. This book, written by senior members of the Oracle team serves as the only hands on guide to provisioning middleware and implementing proactive monitoring to maximize application performance and compliance using Oracle Enterprise Manager. The book starts with an introduction to the challenges faced by middleware administrators in their everyday life, and how Oracle Enterprise Manager helps solve those challenges. This book will help you manage your middleware infrastructure and applications effectively and efficiently using Oracle Enterprise Manager. By following the practical examples in this book you will learn to proactively monitor your production middleware applications running on Oracle Application Server, Oracle WebLogic Server, Oracle SOA suite (such as Oracle BPEL Process manager), Oracle Server Bus, and Oracle Coherence. You will also learn different aspects to proactive monitoring and alert notifications, service level and incident management, diagnostics for production applications, lifecycle automation using out-of-the-box deployment procedures, and patching mechanisms. This book also helps you to master best practices for managing your middleware and SOA applications for optimal service performance and reduced down time. What you will learn from this book? 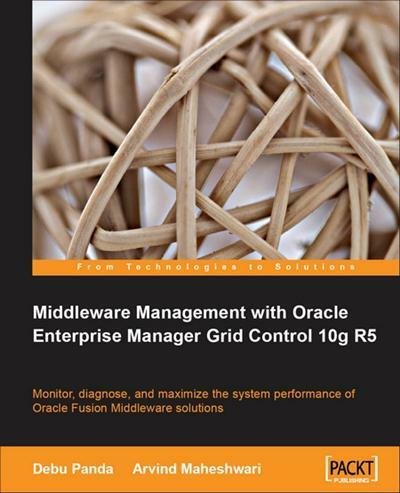 This book is a hands-on tutorial detailing Oracle Enterprise Manager Grid Control's management of Middleware. It is a вЂ?how-to', and provides best practices, tips, and troubleshooting guidelines for managing middleware with Oracle Enterprise Manager. Who this book is written for? This book is targeted at Middleware Administrators, IT Architects, and System Administrators who want to monitor, diagnose, and maximize the system performance of Oracle Fusion Middleware solutions. The book assumes basic knowledge of middleware/application server management. It can also be used by Database Administrators who want to become Middleware Administrators. Arvind Maheshwari, a senior Software Development Manager for the Oracle Enterprise Manager development team, is focused on building management solutions for middleware. He has 15 years of experience in the IT industry and has played the role of developer, consultant, architect, and manager in the financial, manufacturing, and telecom industries, developing enterprise solutions that are deployed in high-availability architectures. Middleware Management with Oracle Enterprise Manager Grid Control 10g R5 Fast Download via Rapidshare Hotfile Fileserve Filesonic Megaupload, Middleware Management with Oracle Enterprise Manager Grid Control 10g R5 Torrents and Emule Download or anything related.